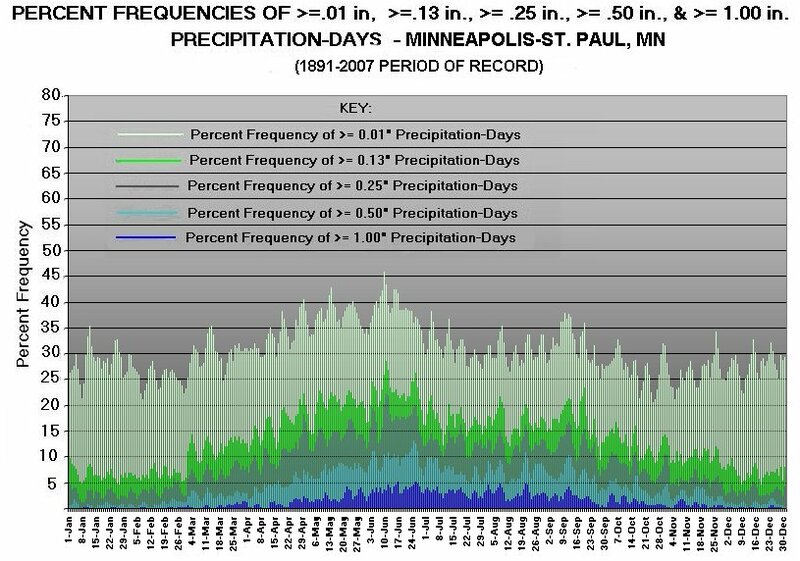 The following is a graphical climatology of Minneapolis-St. Paul, Minnesota temperatures, precipitation, and snowfall, from the start of 1820 (Fort Snelling) into the present year 2018. Presented are summary overview charts, a link to a year-by-year account of early (1820-1869) Minnesota weather history, followed by year-to-year graphs depicting daily temperatures, precipitation, and snowfall. Original source data are from Fort Snelling (1820-1858), St. Paul Smithsonian recordings (1859-1872); and government weather service observations for St. Paul (1873-1890), downtown Minneapolis (1890-1938), and the Minneapolis-St. Paul International Airport (1938-present). Daily snowfall totals date from 1891, snow depth data from 1893. Temperature graphs for the 1873-present period are based on official St. Paul or Minneapolis daily absolute maximum and minimum temperature observations (nearly all for the midnight-to-midnight hourly interval), the standard method of recording “summary-of-the-day” temperature statistics for first-order weather stations. However, original summary-of-the-day temperature observations for the 1820-1872 “Pioneer” era (along with those for cloudiness, wind direction, and wind force) consisted of fixed-time scheme observations conforming to some prescribed format (e.g., 7AM, 2PM, and 9PM; or Sunrise, 9AM, 3PM, and 9PM; or others). For methodological consistency, the 1820-1872 temperature observations were converted into midnight-to-midnight absolute maxima and minima estimates, using application of 1961-1980 statistical regression relationships between Minneapolis-St. Paul Airport temperature, cloudiness, and wind information at hours corresponding to the old fixed-scheme times, and 1961-1980 midnight to midnight absolute daily temperature maxima and minima [Fisk, M.S. Thesis]. This reconstruction created reasonable approximations of the Pioneer era daily midnight to midnight maxima and minima, and in addition to reducing biases in (recalculated) 1820-1872 monthly mean temperatures, allowed for daily maximum/minimum temperature graphs to be constructed, as is done here, for every year of the history.- 1820 to the present. 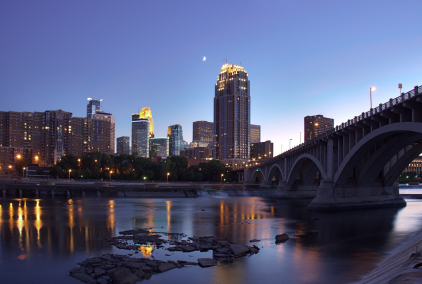 DETAILS ON RECONSTRUCTION OF MINNEAPOLIS-ST. PAUL AREA 1820-1872 TEMPERATURE RECORD. For a given year’s graphical display (see links below), the uppermost chart is a “floating-bar” chart of the daily maxima and minima. Superimposed are two line traces, the upper one connecting average daily maxima, the lower one average daily minima. The bars depict the varying diurnal, synoptic, long-wave, and seasonal influences on temperature over time, and aside from physical interpretations, some years’ patterns can be subjectively quite interesting to look at for their own sake. The second chart down depicts the arithmetic departures of day-to-day mean temperatures (sum of the daily maximum plus the daily minimum divided by two) less the corresponding calendar-day average means. Vertical lines extending upward from the zero line indicate above average means for the day (colored red), those extending downward indicate below average daily means (colored blue). In the entire series of more than 70,000 days, greatest positive departure for any individual day is +40 F on 17 & 18 March 2012, the greatest negative departure -45 F for 1 January 1864. The third chart down shows chart two’s departures in deseasonalized or “standardized” form. This adjusts for the fact that individual calendar days have higher or lower inherent year-to-year variability (standard deviations) in daily mean temperature. Dividing a given day’s departure from average by its’ respective calendar day mean temperature standard deviation creates the “relative” departures or “z-scores”. Only five daily departures in the entire series are plus or minus 3.5 or greater. Three of these, all negatives, came over the four-day period 4-7 November 1991, associated with an unseasonably cold arctic air outbreak in the wake of the Great 1991 Halloween snowstorm. 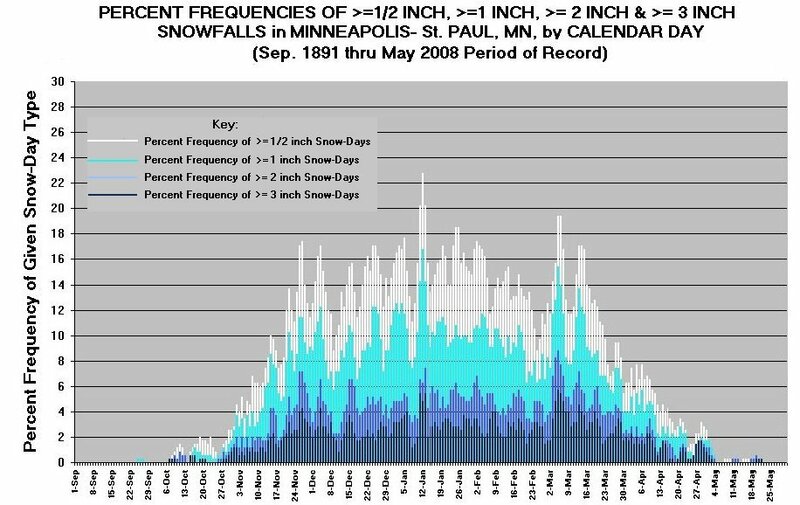 The fourth chart down depicts daily rainfall, the fifth and sixth charts, respectively, daily snowfall and snow depths. 1820 – Year One. Frigid January WEATHER DIARY FOR JAN 1820, very mild April, eleven-inch snowstorm in mid-October. 1820 Writeup. 1838-39 – (July-June view). Abnormal cold over October to December ’38 gives way to abnormal warmth over January to April ‘39. 1875 – Second coldest year in history. January and February both AVERAGE below zero. 1877-78 – “Year Without a Winter”. El Nino-induced extraordinarily mild winter. Mildest December in history. Warmest February until 1931 and warmest March until 1910. 1879 – “Second Edition of Summer” brings unseasonable October warmth. Very cold Christmas Day, minus 39 recorded in St. Paul. 1885 – Great temperature variability over January to March. 1888 – Severe winter (including –41 F in January). Persistent spells of unseasonable coolness into spring and summer. 1895 – Abrupt May cold turn temporarily derails an otherwise forward Spring. 1899 – Great February cold wave. 1907 – Persistent abnormal cold through April and May; 13” snowstorm over Apr 27-28. 1910 – Driest year (11.54”) in local climatic history down to present. Also warmest March in history until 2012. 1911 – Great adjacent-year reversal in annual precipitation – Wettest year (40.15”) in all history down to present. 1915 – Very forward April, but May 4 F colder; very cool summer ensues. 1917 – Coldest year of 20th Century. Deep Snows – 31” depth on 16 March. 1921 – Warmest year since 1878. 1923 – Very cold March, very mild November-December. 1930 – Sharp temperature gyrations over latter part of year. 1931 – Warmest year in history down to the present; 104 F recorded in September. 1934 – In midst of Dust Bowl era. Warmest May in history, including 106 F on the 31st. June has a 104 F day, three days in July reach 105 F.
1936– Great temperature contrasts between winter and summer. Thirty-six consecutive days with subzero minima over January and February (including –34 F in January). Hottest July on record; 108 F recorded on 14th for highest in history. Also recorded in July: 106 F three times, 105 F and 104 F once day each. 1940 – Great Armistice-Day Blizzard leaves nearly 17 inches’ snow over 11th-12th. 1942 – Very irregular temperature anomaly pattern over course of year. 1945 – Very forward early spring, then very cool through early summer. 1947 – Warmest August AND October in all history down to the present. 1948 – March temperature range –27 F to 70 F (97 F spread highest ever for a single calendar month locally). 1951 – 40” snowfall in March. 1953-54 – Quasi-periodic much above normal spells over late-August through February. February ‘54 warmest since 1878. 1958 – Driest year (16.20”) since 1910. 1959 – December 5 F warmer than November. 1962 – Deep snows in late February and early March; minus 32 F on 1 March. 1965 – Coldest March since 1899; coldest September since 1868. 1967 – 35.3” snowfall in January; 30” snow depth on 19 February. 1972 – Coldest year since 1917. 1976-77 – Twentieth century approximate version of 1838-39. Abnormally cold October-January, unusually warm February-May. 1982 – 46.4” snowfall in January, 38” snow depth on 23 January. 1981-82 season sets new snowfall record (95.0”) – only to last two seasons, however. 1983– Great El Nino year. Wettest year (39.07”) since 1911. Very mild January to early March, a warm summer, but coldest December since 1831. 21.8” snowfall in April – a new high mark for that month. 1983-84 – Snowiest winter in official recorded history (98.4”). 1985 – Unusually mild March and April, cold November-December. 1987 – Second warmest year in history. Steady above average warmth throughout virtually the whole year. July wettest calendar month in local history (17.90”). 1988 – Drought year. Very hot summer, 105 F in July. 1991 – Great early snowstorm drops 27” over 31 Oct and 1 Nov followed by unseasonably early arctic outbreak; 46.9” total snowfall for November, snowiest calendar month in recorded history. 1992 – Very mild winter. Very cool summer (possibly induced by Mt. Pinatubo eruption); Coolest July since 1865. 1996 – Great arctic outbreak in late-January/early February. 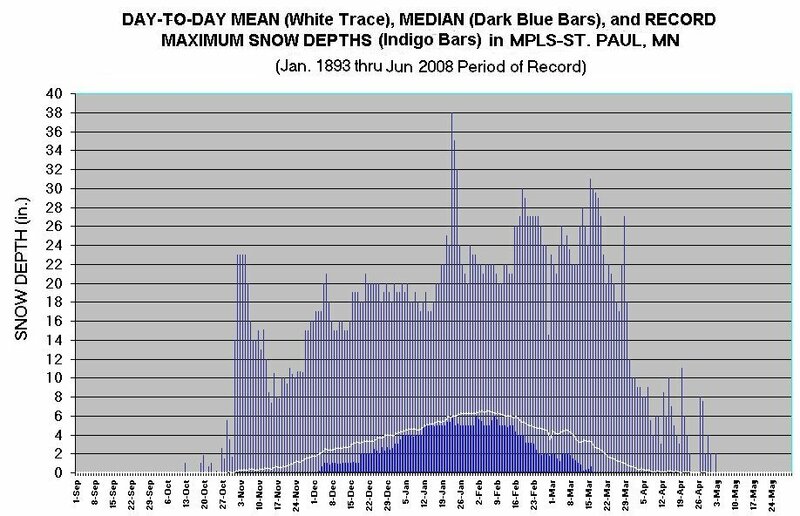 1997-98 – El Nino-induced, very mild ‘97-‘98 winter. 2000 – Very mild March, very cold December. 2001 – Wettest April on record (7.00”). Warmest November in history by more than 4 F. Fifty-seven consecutive above normal temperature days from late October to late December. 2001-02 – Mildest November-February period in all history by nearly 2 F.
2006 – Third warmest year in all history. Warmest January since 1846; warmest July since 1936. 2010 – Warmest August since 1947 and second warmest in history. 2012 – Warmest March in history by more than 3 F.